Yesterday, as the afternoon drew to a close and the snow began to lightly fall to the earth, creating a fresh blanket of beautiful white, I thought to myself “What an absolutely perfect setting for that lentil soup!” Being that I had planned for the occasion, having recently had a strong desire to cook something heartwarming and comfy, I had a bag of lentils in the pantry, the proper ingredients for a mirepoix, and I had stocked up the day before with everything else I would need. Place the olive oil into a large 6-quart pot and set over medium heat. Once hot, add the onion, carrot, celery and salt and sweat until the onions are translucent, approximately 6 to 7 minutes. Add the lentils, tomatoes, broth, coriander, cumin and red pepper flakes and stir to combine. Increase the heat to high and bring just to a boil. Reduce the heat to low, cover and cook at a low simmer until the lentils are tender, approximately 35 to 40 minutes. Using a stick blender, puree to your preferred consistency. Serve immediately. 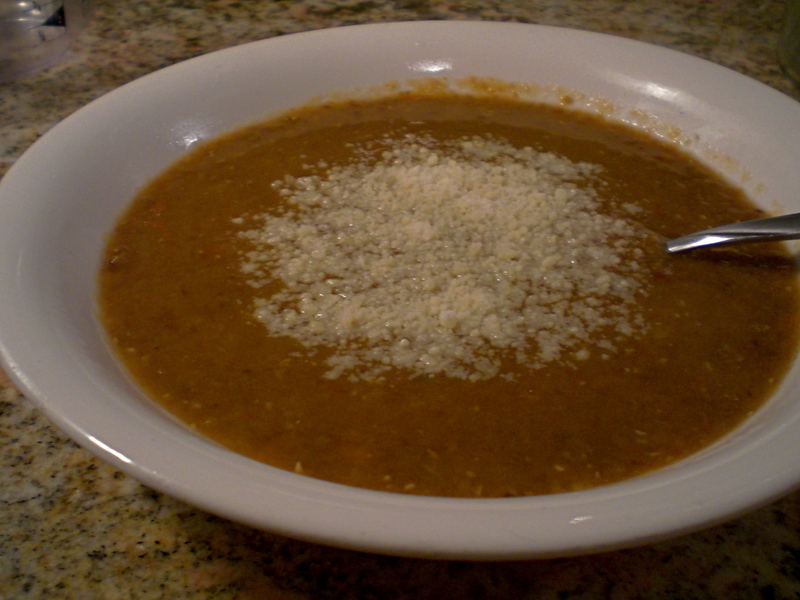 I wanted a slight heat to the soup, which is why I substituted the red pepper flakes for the grains of paradise and it worked out quite nicely, the heat more of a lasting finish instead of being overbearing and frontal. I pureed it to a degree where it still had some whole lentils and wasn’t too silky, giving it slightly more substance. Served in a nice soup bowl with a parmesan garnish and a little salt to taste, this went over quite well with the soon to be Mrs. and my roommate. And with a container full of leftovers, we won’t need to worry about staying warm and comfy for the next few days! If you like a hearty soup, I strongly suggest you try this out; you’ll love it, I guarantee!